My son, your troubled eyes search mine, Puzzled and hurt by colour line. Your black skin soft as velvet shine; What can I tell you son of mine? But I’ll tell instead of brave and fine, When lives of black and white entwine, And men in brotherhood combine – This I would tell you son of mine. Normally, you wouldn’t expect there to be much in common between a five star resort manager and an Aboriginal activist seeking to entice young people away from the “rubbish life” of drink, drugs and desperation. But Couran Cove’s Alistair McCracken and Indigenous activist Joshua Walker were brought together by some powerful words. “Son of Mine” – an early and forceful plea for reconciliation between black and white Australians was written more than 40 years ago by Oodgeroo of the Noonuccal – once better known as Kath Walker. The Noonuccal were “the people of the mullet” one of the clans of Stradbroke Island, driven away from their tribal lands in the early periods of white settlement and struggling to maintain their identity and traditions ever since. But Kath Walker’s words were haunting the mind of Alistair McCracken, general manager of the sprawling Couran Cove Island resort on South Stradbroke Island. Created out of a failed former white shoe brigade development in 1997, the environment focussed 1500 bed, $150 million project lays claim to being the largest ecotourism resort in the world. Indigenous elders were first consulted in the design stage about where to build and where not to build. This preserved a midden – later dated as having its beginnings some 5000 years earlier than the Great Pyramid of Egypt. McCracken eventually asked Oodgeroo’s eldest grandson Raymond Walker and traditional elder Graham Dillon to walk him through a forest he had walked through hundreds of times. With their guidance he saw bora rings, men’s and women’s business areas, initiation sites and markings on trees as clear to the elders as signposts on roads were to him. “I thought, wait a minute, we have a 4 year old resort in a place of immense significance to the local people for the last 8,000 years,” he said. “I was worried the resort had the potential of trivialising the area and decided we needed to tell the whole story”. McCracken was worried the “links to land had been broken and Indigenous Australians were wallowing between two worlds without real connection to either. If this generation doesn’t do something, it will be gone”. He sought out Raymond’s brother, Joshua Walker, then trying with other brothers Denis and Che to get his people to leave the “rubbish life” and move to one which was more spiritually aware, where their Indigenous culture was celebrated and practiced. It had been a hard road for the brothers, caught between “Grandma’s words of don’t hate, educate,” on holidays on Stradbroke Island and the 70s and 80s everyday reality of indigenous culture not being much of a priority at Inala State School. Hungry to learn about their heritage, and with firebrand father Denis Walker senior absent addressing issues of dispossession at a national level, the brothers recognise Aboriginal Australia benefited from his work. “But we lost a father” says Joshua Walker. Lessons about their Aboriginality came in patchy bursts from their European Mother who went to Musgrave Park to take home some tribal words from the elders. Sometimes she would encourage tribal relatives to teach the boys Corroboree in the Inala back yard. Other lessons were much harsher “As a child, I was king hit by Queensland Police repeatedly. Now I am a man there is no way I could do that to a European child”. Straddling both cultures eventually took its toll. The younger Denis Walker felt he was no good to anyone. “I was just getting by, stagnating, I had nothing to offer my family, my wife and baby daughter. I was going to lose it all, the (suicide) statistics showed that”. Joshua and Denis both contemplated suicide, but their lives changed after they were separately taken to Central Australia by the Willowra community of the Tanami desert for initiation. The experience profoundly changed them. “Now we are taking up our power, our initiation, our lore, the lore of the land and our songlines” says Joshua. 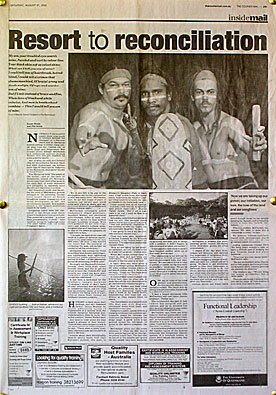 When McCracken issued the invitation to come back to their land and bring the ceremonies, “we were stoked, we thought it was too good to be true”. It certainly hasn’t been easy. After about a year of working together, McCracken felt some residual distrust remained and tackled Joshua Walker about it. He recalls the reply “trust you? Youse have been trying to kill us for 200 years”. A stunned McCracken suddenly realised how it must look from the other side. It made him all the more determined to get the business relationship going. Now the Walkers and their tribal children are presenting up to four shows and Aboriginal bush walk tours a week at the island resort, themselves reconnecting with nearly lost traditions as they explain them to others. The Gwondabah Aboriginal Centre fills that gap, with displays, ceremonial areas, bush trails and interpretive resources. Oodgeroo’s poetry, special effects, a smoking ceremony, and audience participation creates the intimacy the resort and Walkers sought at the design stage. A gentle ochre stripe painted across the foreheads of guests by the dancers completes the show. “I feel satisfied each show to know I have knocked another brick out of that wall” says Joshua Walker. The relationship is not without its difficulties as each side struggles with hard to understand rules and regulations. “We can’t eat or drink in front of guests, or smoke, no hip hop stuff, no jewellery” says Denis. This frustration is offset though “we put up with it because they let us put the guests through a smoking ceremony to get rid of any evil spirits that might be around”. One day, in front of his tribal children and grandchildren, Joshua Walker speared, skinned and cooked a wallaby. The resort with its strong conservation ethic found itself in a difficult position. “I had a heated discussion (with McCracken) and used some obscene language” said Walker. The brothers felt like part of their culture was accepted, and part rejected and say as initiated men they have an obligation to pass on the lessons to the next generation. McCracken says there are strict rules for staff and guests about handling or harming wildlife on the island and unfortunately in a corporate situation it is up to him to apply the rules. “I still don’t have the answer on that one” he admits. A more serious problem occurs with the standby nature of the business structure the Indigenous dancers operate. If a threshold number of guests don’t request the shows, they are cancelled. McCracken is amazed that international guests request the shows, while Australian guests are often disinterested. “I dream of the day when Australians will recognise and celebrate the importance of Indigenous Australians to our society,” he said. “We are struggling enough to revitalise and learn our culture and get it going. We have to get Aboriginal people to cross their stereotypes in order to embrace their culture to do the shows and that is difficult. It isn’t like any other trade where you can dial up a plumber or electrician in the yellow pages”. “Problem is, I am telling people, embrace your culture and it can look after you financially”. Walker points out when there aren’t enough shows he has trouble keeping his dancers and persuading others to leave the “rubbish life” behind. This is a problem McCracken recognises “We have to make this a commercial success.” He believes volume contracts signed with International travel agents should take care of the problem in about six months. Getting them all through is admiration on both sides. Joshua Walker commends Couran Cove “for being brave enough to take on such a difficult task of bridging the gap between black and white Australia”. “That man is a very special spirit” McCracken said, “He and his brothers are so important to their people and it is a privilege working with them. I want to give him the platform he deserves”. McCracken said he had faced some opposition but it was minor compared to the everyday difficulties faced by Joshua Walker. “At one point he was setting up the business and running the shows while living in the bush on the island because no real estate agent in the Gold Coast would rent to him because of his Aboriginality,” McCracken said. “When I think of that, I think how dare we judge them”. “We are doing this because of Grandma’s ‘Son of Mine’ poem” say the brothers. They are also doing it because they can see the magic in their children’s eyes when they start to learn. He knows Oodgeroo would approve. “Grandma would say “Good on you my grandsons. Keep going and give it to em”.